Notre Dame de Paris is a Gothic cathedral on the eastern half of the Île de la Cité in Paris, France, with its main entrance to the west. It is the cathedral of Paris and the seat of the Archbishop of that city. 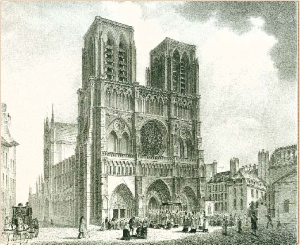 Notre Dame de Paris is widely considered one of the finest examples of French Gothic architecture. The cornerstone was laid in 1163 by Pope Alexander III. The high altar was consecrated 20 years later, and the nave was completed except for the roofing in 1196. However, in 1230 the nave was reconstructed and the present flying buttresses were added.